Whether you’re an entrepreneur, athlete or educator, public speaking is an inevitable task. Depending on your job, you may have to speak at an event or conference, address a room of full of business colleagues or present new product information to your staff. Being a strong public speaker can also help you advance in your career and increase your reputation within your industry. To improve your public speaking skills and deliver a powerful, engaging speech, follow these public speaking tips from Lawrence Mitchell, an internationally renowned public speaker. Discuss 3 main points –You want your speech to stimulate action from your audience and resonate in their minds. To do this, you should only discuss 3 main points in your entire speech. Repeat and reinforce those points throughout your speech so that your audience clearly understands them and how they relate to your overall message. By using more than 3 points, you risk losing the attention of the audience. Don’t misuse PowerPoint – If you must use PowerPoint, only use it to reinforce what you are saying. Do not display text on your slides because your listeners can not listen to your words and read the slides simultaneously. Rather, you should only use PowerPoint to present charts, illustrations, graphs and data. Stay on track – To avoid losing your audience’s attention, stay on track. Make sure your speech fits within your designated time frame because presentations that are too long will eventually start to bore the audience. To help you manage your time, place a watch on the podium so you can occasionally glance at the time. Leave time for questions – Speeches that are engaging and captivating often stimulate a discussion. 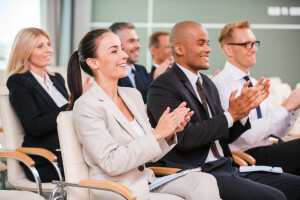 Your audience members will likely have questions once your speech has ended. Make sure you allow time at the end of your presentation to take questions from the audience.